Rob is a highly sought-after instructor, teaching workshops and doing demos for institutions such as The Portrait Society of America, American Artist Magazine’s “Weekend with the Masters” programs (and one of their first “webinars”), and for Nelson Shank’s Incamminati school of realism, as well as conducting frequent workshops in the U.S. and abroad. He is considered a Modern Master by The Art Renewal Center. He teaches regular classes at The Art League of Virginia. 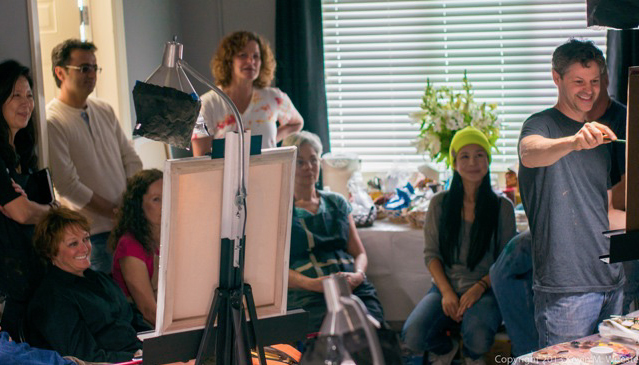 Rob teaches several types of workshops including painting, drawing techniques and anatomy. He specializes in the portrait and figure. A typical workshop day includes instruction and demonstrations with discussions. He will touch on a variety of approaches, usually illustrated with slides. The itinerary can be tailored to each school’s curriculum. All skill levels are welcome. Rob is also available for painting or drawing demos, including portrait, figure or anatomy. All of Rob’s upcoming events (including workshops and demos) are listed on Rob’s website, and in his periodic email newsletters. We can also do a specific mailing about your workshop and post it on Rob’ s Facebook “group” page. We have a rather large list of students and artists who have expressed interest in attending his workshops, to which we send out information. This has proved to be a very effective method in filling his classes. Also, supply lists for each workshop will be listed on the website. $2000 per day plus travel expenses (gas or airfare and/or hotel if necessary and all or part of rental car if needed). 30 students maximum per workshop. On occasion Rob will be accompanied by an assistant who will help out with class set-up, lighting, etc. This will not incur additional expenses to the hosting school. However, the assistant will attend the workshop along with the class. Rob often uses the contract drawn up by the hosting school or organization. We also have a contract drawn up when needed. View it here.